1. Our universal car seat covers are easy to install, easy to clean and are airbag compatible. Fits most cars, trucks, SUV’s and vans. 2. Due to installation requirement, please ensure your headrests can be detached before buying this set. 4. Back of the front seat is made by durable stretchy material with opening pocket for storage. 5. 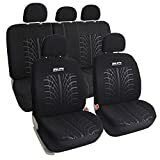 Bottom bench cover and backrest cover come separately, which is designed to accommodate infant/child car seat, allow you to fully utlize the belt or built-in anchors behind the lower backrest. 6. Backrest and bottom covers both have 3 zippers. Accommodate left and right 40/60 spilt,60/40 spilt,40/20/40 spilt and 50/50 spilt, an extra set of zippered cloth is included to cover the exposed rear bench area when spilt. 1. Customer will be responsible for return shipping costs. 2. When the merchandise has been used, it will not be eligible for return. 3. In case of damage, defective or incorrect item, please contact us immediately for assistance . We will replace parts/products right away. MATERIALS AND CLEAN: Feature innovative mesh cloth with 3mm foam padding, very soft, durable and breathable, Machine washable and air dry.